What does the rise in social media mean for a new generation of veterans and the organizations that serve them? This story was published in all nine Straus newspapers on June 16 and 17, 2011.
with either. Although he hates computers, it’s through Facebook that he keeps in touch with his fellow Marines. The VFW, which peaked in 1992 with 2.2 million members, is down to 1.5 million members, although it remains one of the largest veterans’ organizations in existence. “We know young folks these days have very little discretionary time, especially with both spouses working,” said Joe Davis, a spokesperson for the VFW. “They can become actively involved later in life when they have more discretionary time. Having your name in that membership roll keeps the doors of Congress open.” The American Legion has seen a similar decline in its membership from 3 million in 1990 to 2.4 million today. Practically everyone Brandon Friedman met during his two-year deployment in Afghanistan and Iraq was on Facebook or Twitter. Friedman, 33, is now the director of online communications for the Department of Veterans Affairs. The IAVA created Community of Veterans, a social media site exclusively for veterans of Iraq and Afghanistan. Last year the site’s membership grew 243 percent to 15,000 users. A big distinction between the IAVA and other veterans’ organizations is that it does not maintain local chapters or posts. This is perhaps the strongest signal that physical communities are being supplanted by digital ones. Like Vietnam veterans, soldiers who fought in Iraq and Afghanistan face a unique challenge upon their return home. The current ten-year conflict has two fronts and an entirely volunteer military, which can make it easy to take an attitude of ambivalence towards the wars or ignore them altogether. “In rural areas this problem is particularly compounded because there may not be another person within five miles that was deployed or understands these issues,” said Freidman. 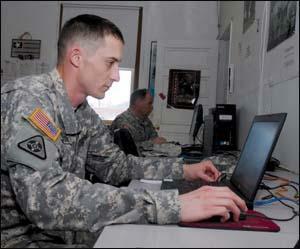 Social media can help fill that gap by enabling veterans to keep in touch without having to travel, he said. Raughter of the American Legion wishes more veterans from Iraq and Afghanistan knew about the Legion’s advocacy work in Washington, like the role the organization played in the passage of the new G.I. bill. But while to some degree membership is tied to the amount of clout in Washington, the pedigree of both organizations is well established in Congress. Davis of the VFW said that even though the organization’s membership will decline, the advocacy they do on behalf of veterans and soldiers will go on. This story was originally published in an alternative story form with supplementary graphics. To download a PDF of this story as it appears in print, click here.